I finished up Misery. I love these Stephen King readalongs. We have such a good time with it on Twitter and Instagram. Right now I'm in the middle of The Small Backs of Children by Lidia Yuknavitch. I'm not sure what to think of it quite yet. The language can be arresting, beautiful even, but there's a bit of grandiosity there that is sticking in my craw. 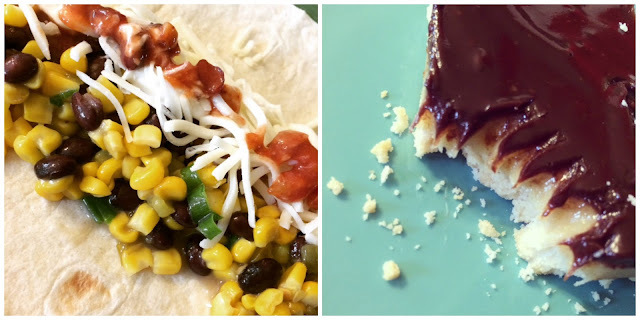 The hits this week were corn and black bean wraps and a pan of copycat Twix bars. YUM. 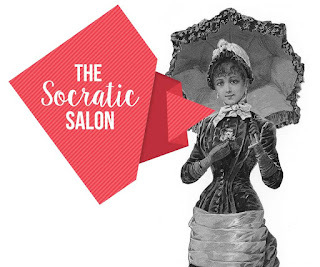 This week on The Socratic Salon we've discussed audiobooks and All The Birds, Singing. Come join the conversation! Season 3 of Orange is the New Black is here! Hallelujah! I spent a day with my best pal/sister. We live an hour apart and when we're together we treat it as an event. We shopped, we ate, we went to a candy store to ooh and ahh over their nostalgia section. (Candy cigarettes! Ha!) I grabbed some fudge for me and some gummy eggs for my nephews. I also picked up a new pair of bitchin' running shoes during our shopping spree. I'll tell you right now that this girl will be using them for walking. Not running. We were also able to visit my oldest daughter (and her new kitten!!) in her new apartment. It was a great day. What's up in your neck of the woods? What are you reading? Are you cooking anything delicious? Tell me all about it in the comment section. Have a great week, everyone! Muah! Woah - that pan of Twix copycats is calling my name! And, Misery scared the living bejesus out of me when I read it years ago! So, then I of course watched the movie and still can't get the image of Kathy Bates holding a hammer over that guy's ankles out of my head! They were really good. They were fussy to make, with all the layers and such, but they were worth the trouble. Ha ha, wasn't she the best/scariest in that movie!? You've had a wonderfully well-rounded week...a little reading...a little visiting...a little cooking...excellent! It really was a good one :D Good food, good books, good company! Sounds like you had an excellent week! Those black bean wraps look delicious! Those wraps were SUPER. Even better was how simple they are to throw together. Easy peasy weeknight dinner/lunch. Copycat Twix bars? Holy cow... I'm grabbing that recipe right now! Thank you! Those corn and black bean wraps look delicious! I need something quick like that for lunch--just never think about it when I'm doing my planning! Those wraps are super easy to toss together, gotta love that! I didn't see that video but I'm going to go look for it right now. She's been posting the best stuff, lol. I neeeeeed to make those Twix! Errrr my! Also, reading. I need to do some of that. I need to stop visiting your blog when I'm hungry because this is the worst...you know I don't have the means of making any of those things, so I'll just end up buying a bag of Twix or something. Your day with your sister sounds great! My sister lives just blocks away and we rarely see each other; when she moved that close, I think we were both working so hard to make sure that we didn't start tripping over each other that it ended up going the other way. We really do need a day like yours! Ugh. It's too hot to cook. I did make some pasta at lunch with just olive oil, garlic, and fresh basil from my garden. Yummy. I missed the read-a-long this time... bummer!! 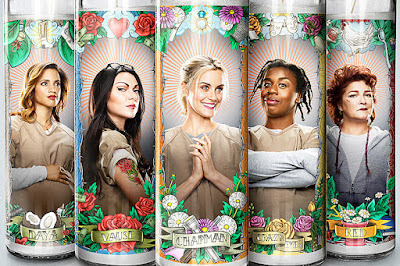 I JUST finished season 3 :) How are we supposed to wait ANOTHER year??? Sad I missed the Misery RAL, even though I know you told me about it. I need those black bean wraps in my life. NEED. The wraps are super easy to throw together, I promise! If you find any extra Twix, feel free to send them to NJ!! I have both of those recipes on my to-make list once we get back from the national dance competition. I cannot wait to have things get back to normal and start cooking real food again! I bet your family can't wait either ;) I've been keeping up with the dance happenings on Instagram, it looks like FUN. A lot of work, but fun too. I was really excited for season three of OITNB, but got bronchitis and binge watched Goosebumps instead. Don't ask me the connection. I'm reading a crime novel by Kelly Miller that's okay so far. I'm aware of Lidia's new book and want to read it, though her sentences can be hard for me to comprehend sometimes. Loved her memoir. I ended up setting Small Backs aside. It just didn't work for me. I'm bummed about it because I had high hopes. Ah well, they can't all work. Right? I'm catching up on reading blog posts this morning as we were out of town yesterday. I'm not cooking anything, as usual, but I did have some great...wings, what else?...last night at a place called Nickel's Pit BBQ in Watkins Glen, N.Y. I'd like some new running shoes too...but for walking also. I'm totally with you on that.